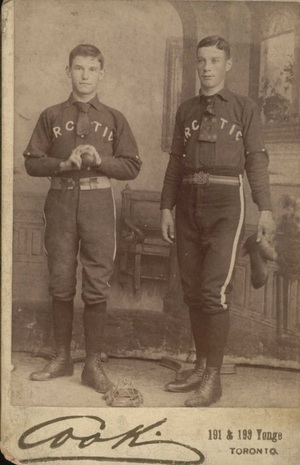 Chum (left) as a young baseball player. The next child, number six, born to John McEwan and Janet Stevenson was Henry (Chum) McEwan. He was born in Toronto July 11th 1874. Henry was born with a "caul" which is veil of skin that covered his face. According to some this is seen as good luck. It occurs in 1 in 80,000 births, and therefore very rare. A legend developed suggested that the possession of a baby's caul would give its bearer good luck and protect that person from death by drowning. My great-grandparents must have believed somewhat in such legends because this "veil" was folded and placed in a locket made by my great-grandfather that became "Chum's watch fob as a young man. It did not bring luck to Chum however. Chum would become a pitcher for the Toronto All Stars when he was a young man. This was a professional baseball team in Toronto before the American and National Professional Baseball Leagues came into existence. ​ He married Elizabeth Gorrie (1877 - 1899) daughter of Samuel and Isabelle (Ridelle), missing the date, Chum was working as a printer. Elizabeth died shortly after they were wed.
​ He then married a second time, June 4th 1902 in Hastings, Ontario. His second wife was Esther Gorton. She was from England and her parents were William Gorton and Jane Wright. Henry, sometimes called Harry, other times “Chum”, died from and abdominal abscess when Jane was just two years old. He died April 2nd 1905 in his thirty-first year and is buried at the Toronto Necropolis Cemetery. * Many of the family remember visiting with his daughter Jane and her husband Harry Ryan who lived in Niagara Falls, Ontario. Jane and Harry never did have children. Lilly McEwan-Bell and Jane were good friends as well as cousins and Lilly and her husband Kelly spent many a weekend with them after they were married. Once their children were born it became a little more difficult but I remember going with my parents going to see Jane and Harry. We always went around Easter and visited the beautiful greenhouses in Niagara Falls as well as a visit to the Falls itself. Chum's watch fob that contained the "veil"